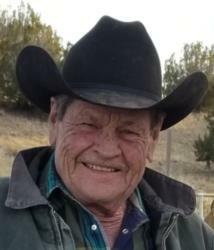 Kenneth “Tay” Sullivan, age 70, of Dusty, NM passed away on August 5, 2018 with his wife Cherrill and family by his side. He was born on December 23, 1947 to Ira and Eunice Sullivan in El Paso, TX. “Tay” as he was fondly known to his family and friends spent his younger years growing up in Los Lunas, NM in the Luna Mansion. He attended kindergarten in the one-room school house in Dusty, NM then completed school in Los Lunas. In 1965, he returned to the Bar A family ranch, which was established by his great grandfather Cornelius in the late 1800’s. In 1971 he married the love of his life, Cherrill Hughes, and together they raised their children. Over the years, they ranched, rodeoed, and ran Cherrill’s Western Apparel in T or C, NM. Tay was a fun-loving, one-of-a-kind, individual with a kind heart that lived life to the fullest. He loved the outdoors, Charolais cattle, good horses, and spending time with his friends. But most importantly, he loved his family. Some of the highlights of his life included watching his son Travis win the World High School National Finals in 1987 and making the NFR in 1997. He was especially comforted by the loving compassion of his daughter “Missy” and granddaughter Breana during his struggle with cancer. He is survived by his wife Cherrill, daughter Melissa “Missy” Sullivan, sons Travis Sullivan and Chip Welty, grandchildren Dusty Reid, Brittany Reid, Breana Reid, Kenna Sullivan, Luke Sullivan, Destiny Welty and Trantham Welty, a brother Charles Sullivan and his wife Bobbie, brothers-in-law Billy Hughes and Rusty Hughes, and sisters-in-law Annette Hughes and Melanie Pettis. He was preceded in death by two brothers, Ira Joel Sullivan and C.P. Sullivan. Other survivors include nieces Dallas Sullivan and Destri Sullivan, nephews Patrick Sullivan and Jody Sullivan, and numerous great grand nieces and nephews. Funeral services will be held August 11, 2018, at 10:00 a.m. at the First Baptist Church in T or C, NM. Burial will follow with a procession to the Bar A Ranch in Dusty, NM where Tay will be interred beside his father and mother. Reception will follow the burial at the Winston Community Center. Pallbearers include Charles Sullivan, Travis Sullivan, Luke Sullivan, Dusty Reid, Patrick Sullivan, and Darryl Sullivan.